2) Click on Tools and select Accounts. 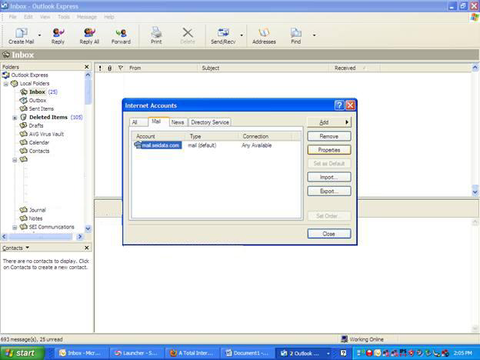 3) Select our e-mail account (likely named mail.seidata.com) and click on the Properties button. 4) Select the Servers tab, then click on the checkbox near the bottom of the window titled "My server requires authentication" and click the "OK" button. 5) Click on the "Advanced" tab. 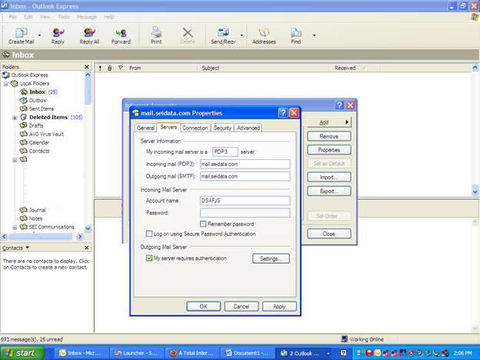 Click the checkbox titled "This server requires a secure connection (SSL)", then change the number in the Outgoing Mail (SMTP) field to 465, then click the checkbox under the incoming mail (POP3) titled "This server requires a secure connection (SSL). The number above will automatically change to 995, then click on the "Apply" button. 6) Close the open windows as needed, then close Outlook Express. 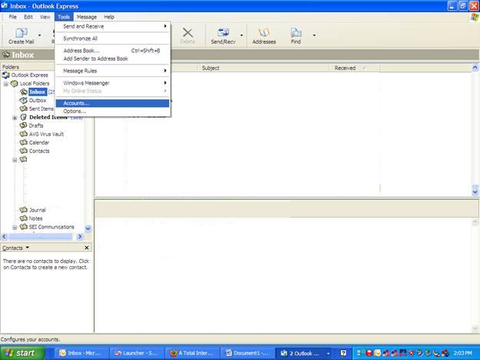 7) Re-open Outlook Express and test sending an e-mail.